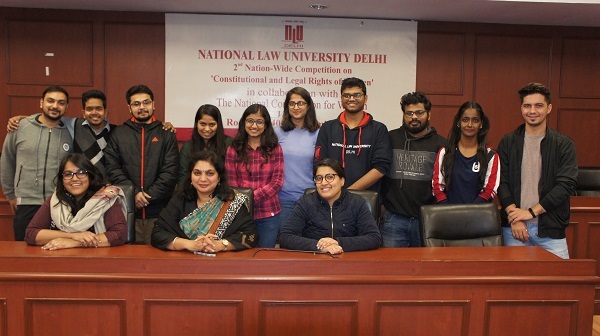 The National Law University, Delhi organized 2nd Nation Wide Competition on 'Constitutional and Legal Rights of Women' for students of the university in collaboration with National Commission of Women on 6th December, 2018. The competition saw participation of around 35 students in an hour long written test comprising of Multiple Choice Questions competition on various laws dealing with women issues. Mr. Puneet Dinesh, third year student of B.A LL.B (Hons.) programme at NLU Delhi has been adjudged as the winner of Kachwaha & Partners 5th Arbitration Excel essay writing competition. Mr. Puneet Dinesh being the 1st prize winner in the said competition won a cash prize of Rs. 1 Lakh . Winner, People Speak Parliamentary Debate, Sri Venketeshwara College, Delhi University (Sanjeevi Seshadri (5th Year) and Raunaq Chandrashekar (5th Year) were adjudged BEST and 2nd BEST speakers respectively). A team consisting of Sanya Sud, Saniya Sharma, Dev Dutta Mukhopadhyay and Hardik Singh from NLU, Delhi participated in the 11th ICC Mediation Competition, 2016, held in Paris and received Best Mediation Advocacy Award from ICC besides receiving excellent feedback from judges. The University Administration hereby congratulates these studentsfor their achievement and for bringing laurels to the University.